Morning after, Day ahead...: Happy Thanksgiving!!! The menu is by request of Chad; all things he loves and misses from home: Macaroni & Cheese, rice & peas (Chad is Jamaican and this dish is a staple in his household), his Mom's famous potato salad, collard greens, sweet potato casserole, and of course turkey. Definitely a non-traditional menu but it will be good! 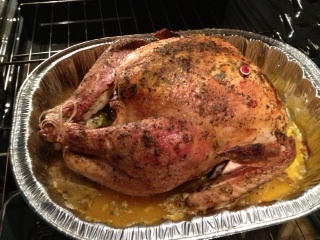 I woke up at 4am to put the turkey in and boy does it smell good. Since I'm now a vegetarian, I won't be partaking in the turkey but I will say I'm proud of how it looks thus far ;) (see below). This Thanksgiving, I'm thankful for the genuine support I've received from my family and friends throughout medical school as I make it to the home stretch! I couldn't have done it without you! I'll be sure to post more pics of the food and recipes!